1. Toss the chicken in a bowl with the spices, 1 tbsp oil and the lemon zest; season and set aside. Toss the onion in a bowl with the lemon juice and a pinch of salt; set aside. Toss the courgette in a third bowl with the remaining ½ tbsp oil and season. 2. Heat a griddle pan over a high heat and griddle the courgette, in batches if needed, for about 2 minutes on each side until charred; set aside. Next, griddle the chicken for about 4-5 minutes on each side, or until there is no pink meat or juices visible. 3. Meanwhile, season the grated cucumber with salt and place in a clean tea towel or kitchen paper and firmly squeeze out the excess liquid. Tip into a bowl with the yogurt, season and stir through the garlic and mint. 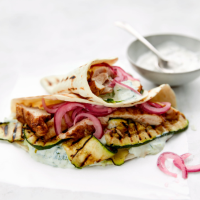 Slice the chicken and serve on flatbreads with the courgette, tzatziki and pickled onion. No time to marinate and fry the chicken? Try Waitrose British Chicken Sun-Dried Tomato & Chilli Breast Fillets, which can be oven-cooked in 25 minutes. This recipe appeared within the March 2018 recipe card collection.